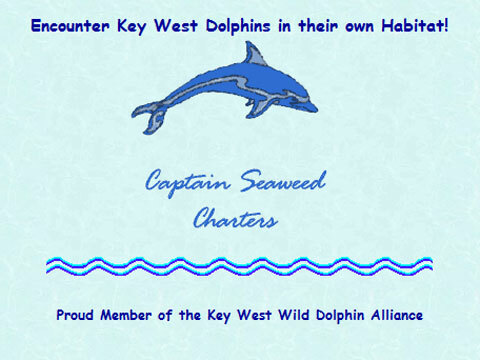 Welcome to Captain Seaweed Charters, Inc. home of the popular Island Eco tour to see dolphins swimming in clear Key West, Fl waters. The tours include an exploration of the uninhabited Florida Keys mangrove islands, a dolphin encounter in the wild, and a chance for you to go swimming and snorkeling in the clear warm waters where the wild dolphins swim. What's even better than watching the dolphin swim? Watching a dog and dolphins swimming together. . Catch our photo gallery of Captain Seaweed, a 6 year old labrador, as she swims with the Key West dolphin. We also offer custom charters for private Key West snorkeling trips, fishing and dolphin watches/encounters - these eco tours have become a very popular Key West attraction - one of the most fun things to do in Key West. Imagine seeing a pod of dolphin swimming in the wild! Key West Island Eco Tour: Wild Dolphin Swimming & Snorkeling Leaping DolphinsThis wonderful eco tour includes watching wild dolphins swim and the delight of swimming and snorkeling in the warm waters off Key West! For an idea of what you will see and experience, take a look at our dolphin photos. Encounter dolphins in their natural habitat, wild and free. Swim and snorkel in the same Key West waters where these fun loving, playful animals live and play. Experience first hand the beauty of our islands and the calm of the crystal waters of the Florida Keys. This trip has everything! Watch the dolphins, see the wildlife and snorkel amongst the treasures of Key West, Florida waters. As we approach the dolphinsâ€™ playground, they may come to the boat and ride the bow waves! Itâ€™s just their way of saying, â€œHello! Letâ€™s play!â€œ For more about our Island Eco Tour: Key West Dolphin Encounter. Here are our rates. We've compiled some educational materials so you may learn about the Florida Keys dolphins you will encounter. You may also want to visit the Wild Dolphin Foundation. Snorkeling in Key West, Florida Keys Waters Kids Snorkeling You will be amazed at the wildlife you will encounter on our Key West dolphin tour! Through the crystal waters, you may see Turtles, Stingrays, Manatee, and more. And there are creatures that hide beneath the corals and seaweed. But, as we snorkel the beautiful backcountry waters of Key West, itâ€™s important not to molest any of the marine life or their habitat. Note: Please do not disturb our marine waters. Turning over rocks, walking on grass beds, and dumping of garbage is very harmful to our delicate marine life. Lets all do our part to keep the waters of Key West and waters everywhere pure and healthy for the next generations to come. Key West is more and more popular as a family resort and vacation destination - and dolphin watching is one of the most popular Key West attractions for families and kids. You can just imagine the delight on the faces of your children as they watch these amazing marine mammals! Family Fun Fishing Another great Key West attraction: fishing in the backcountry is fun for the whole family...perfect for a Key West family vacation. If this is the first fishing experience for the children, watch as they fill with excitement when they land their first fish This can be added to the Dolphin/Snorkel Excursion. More information about Key West fishing charters.